Course Management – Add courses, their duration and fees. Batch Management – Add multiple batches in a course. 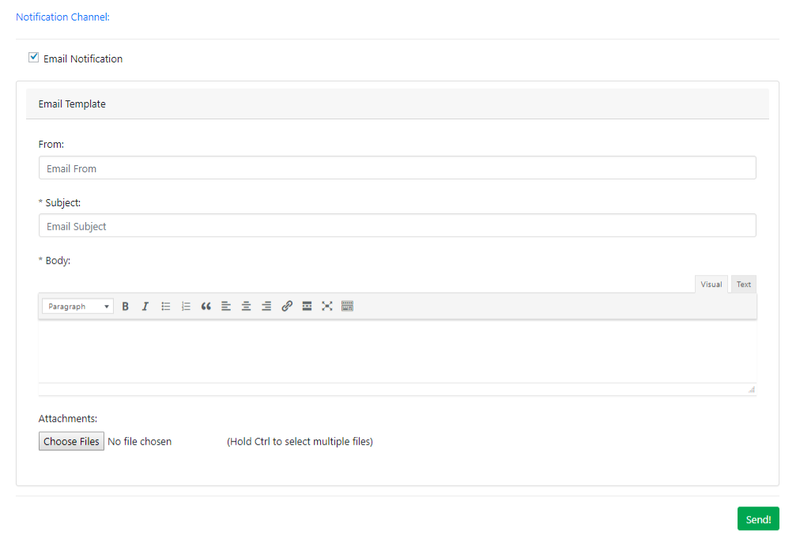 Enquiry Management – Receive enquiries from front-end or add directly from admin panel. enquiry. Then, enquiry can be removed or marked as inactive. Also, mark the course as completed. a student enrolled in a course. Staff Management – Add an administrator to manage courses, enquiries, fees, students etc. Access Control – Assign task to an administrator having certain permissions to perform the task. 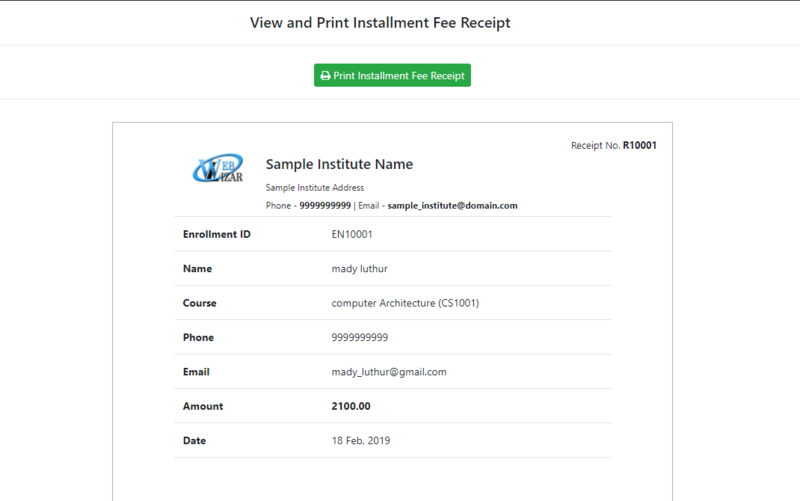 Print Fee Receipt, Report, ID Card, Admission Detail and Completion Certificate – Print fee receipt for each installment, print fees report, admission details, student’s ID card and completion certificate. Institute Noticeboard Widget – Display important notices on your website with Institute Noticeboard Widget. Send Notifications – Send notifications to a batch or individual students with attachments (to send notes, time table etc.). Export Records to Excel, PDF Format – Easy to export student records to excel or pdf format. Search and Filter Records – Search and filter courses, enquiries, students, fee receipts. Here, you can configure institute details like name of institute, address, phone, email, logo etc. 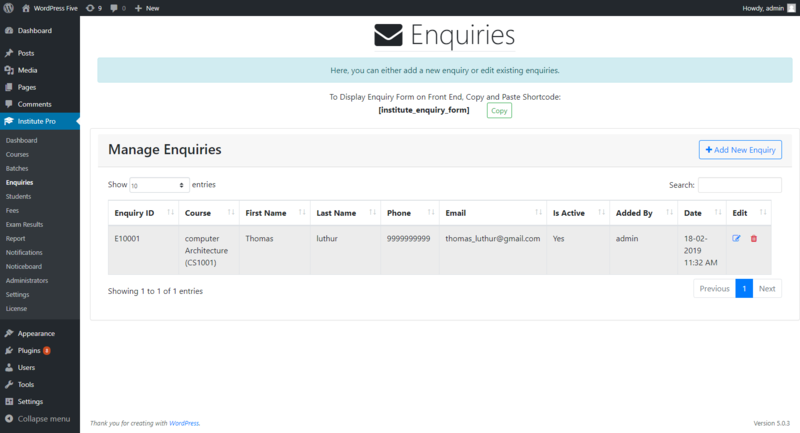 Also, you can set the enquiry form title to be displayed via shortcode on post/page. Here, you can configure notification settings. Currently, email notifications are available. 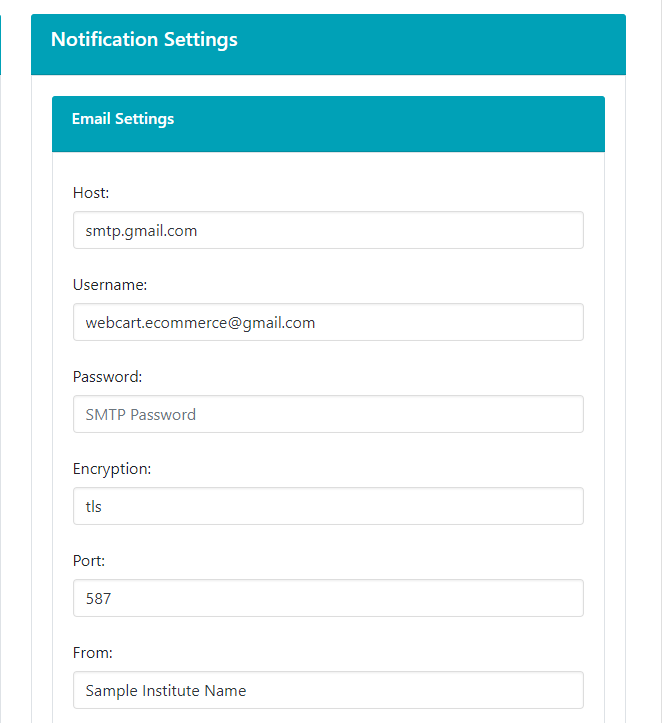 To send emails notifications to students, you will first need to configure SMTP settings. 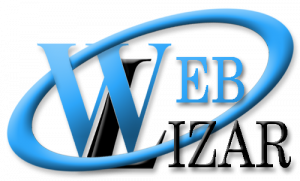 Currently, two payment methods are available: PayPal and Razorpay. You can set Currency and enable or disable payment methods. 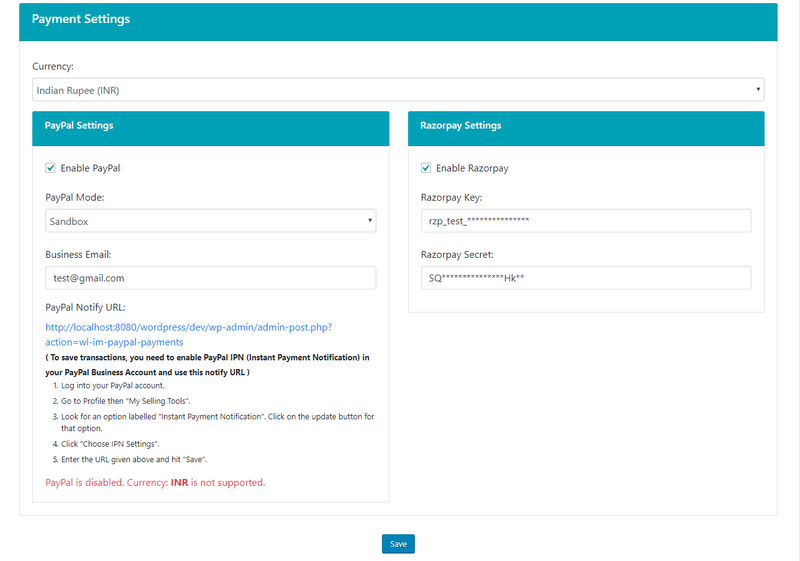 For PayPal, you will need to enable IPN Notifications and set Notify URL in your PayPal Business Account. Here, you can view statistics of institute such as number of courses, batches, enquiries, students, fees, installments, recent enquiries and popular courses. Here, you can add a new course, its name, duration and fees. The course code should be unique. You may want to add multiple batches in a course. To do so, navigate to “Batches” tab and click “Add New Batch”, select “Course” in which you want to add this batch and provide batch code, batch name (optional). You can either use a shortcode to receive enquiry from admission form on front-end or you can also add a new enquiry from admin panel directly. There are two ways to add a new student registration, either from existing active enquiry or directly. Also, you can provide first fee installment at the time of registration of a new student. 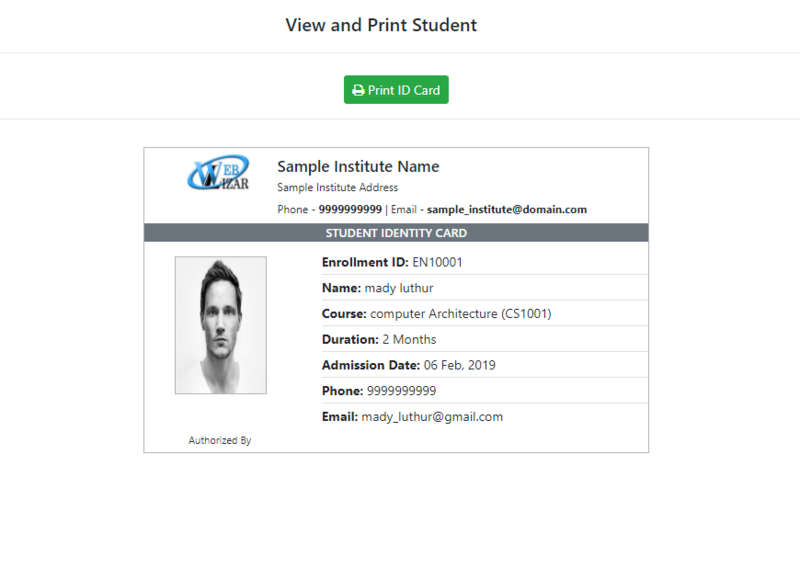 To allow students to access their respective dashboard, check Allow Student to Login checkbox and also provide Username and Password as login credentials for a student. Only then, they can login to their dashboards and view their fees report, admission details, ID card, completion certificate and also pay their fees via suitable payment method. 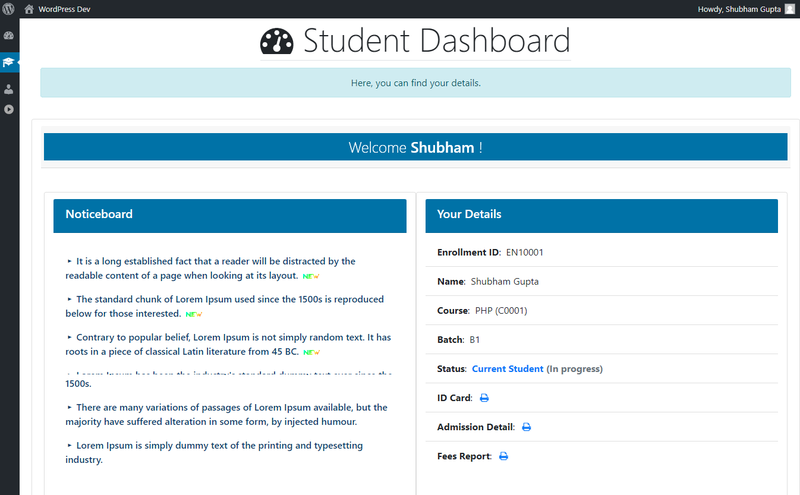 Student dashboard allows student to view their details, fees report, notices etc. and pay fees. Students can pay their pending fees by selecting a suitable payment method. In “Fees” menu, you can select a student and add a new fee installment. After adding an installment, you can print fee installment receipt. 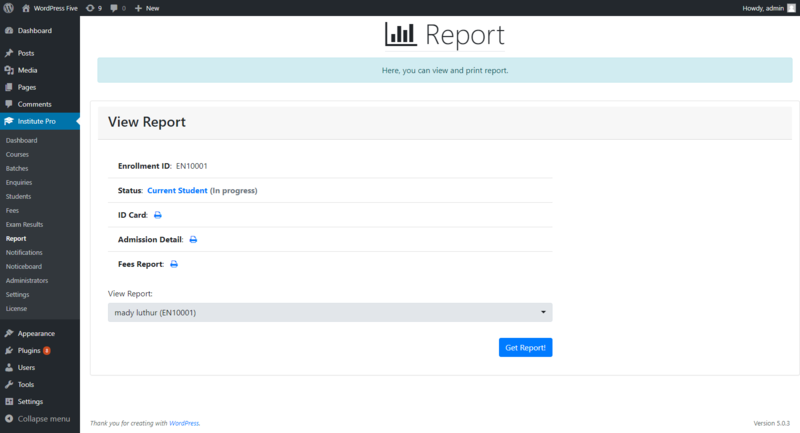 In “Reports” menu, you can select a student and print ID card, fees report, admission details or completion certificate of that student. It is also possible to export student records to Excel, PDF etc. After fees is paid by the student for a course, you can mark the course as completed for that student. 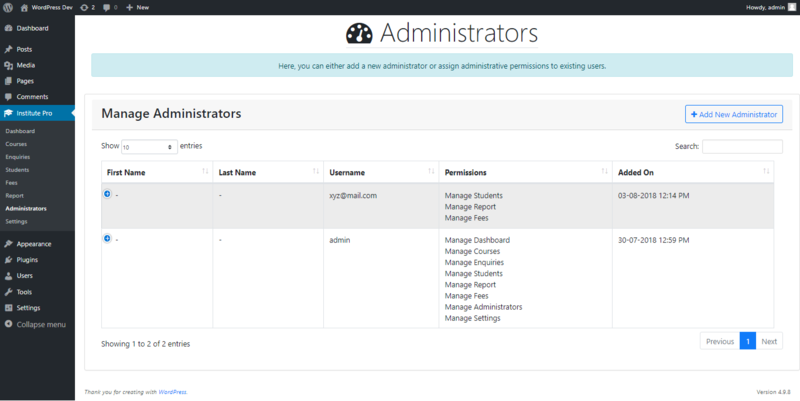 You can add a new administrators with necessary permissions to manage particular sections. 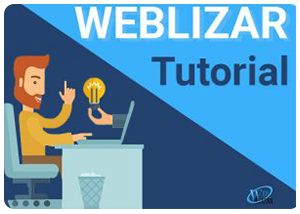 Noticeboard widget can be used to display notices on your website. To add a new notice to noticeboard, navigate to “Notices” section and click “Add New Notice”. Now, you have to select the “Notification Channel”. Currently, there is email notification. Here, you can also send multiple attachments. The advanced version of institute management plugin supports multiple custom fee types. You can add a new fee type in “Fees” section, by clicking on “Add New Fee Type”. 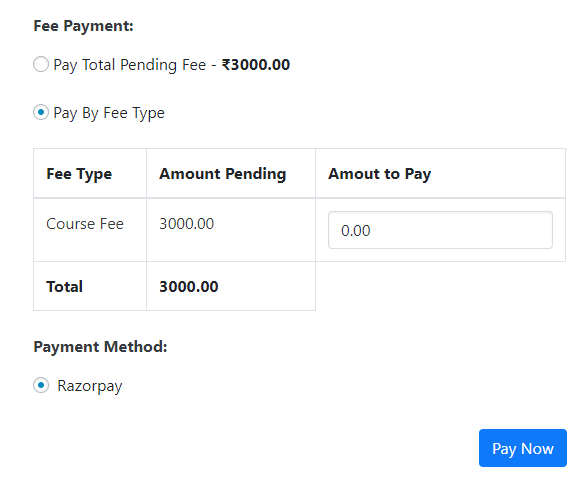 Note that the “Course Fee” type is defined automatically at the time of adding a course’s fee. All of these custom fee types along with “Course Fee” will be shown at the time of adding a new student where you can specify the type of fee payable and fee paid of respective fee type. 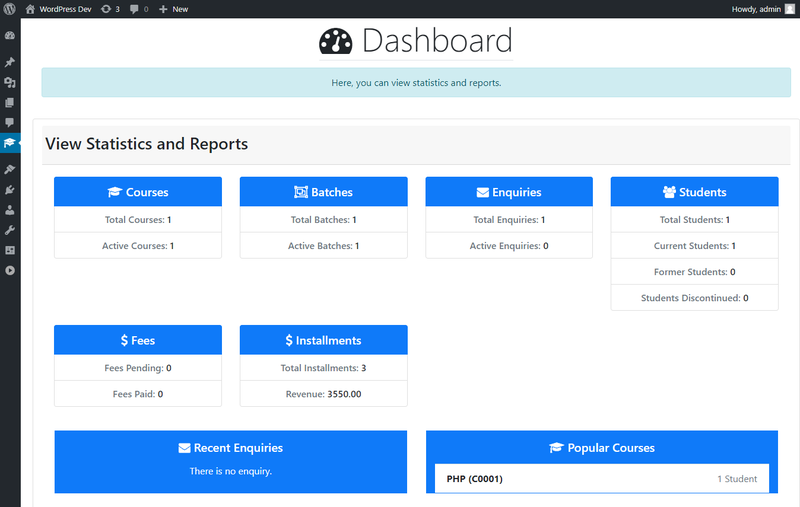 At the time of adding a new student, the “Course Fee” along with all other custom “Fee Type” will be populated. 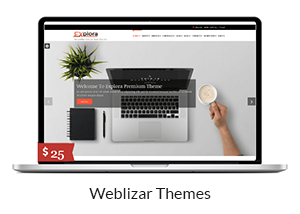 Here, you can specify the custom amount payable and amount paid for each fee type. 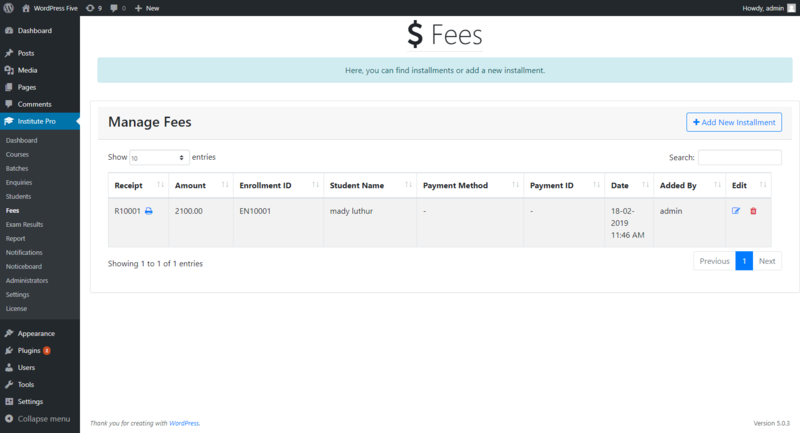 Also, you can add new fee type directly if required for a particular student. When student is added, the first installment will be generated if any of the amount was paid for a fee type. To add new installments for that student, navigate to “Fees” section and click “Add New Installment”. Here, you can find the amount which is pending for a fee type and add respective installment amount for that fee type. The receipt will show the total installment amount along with fee types. 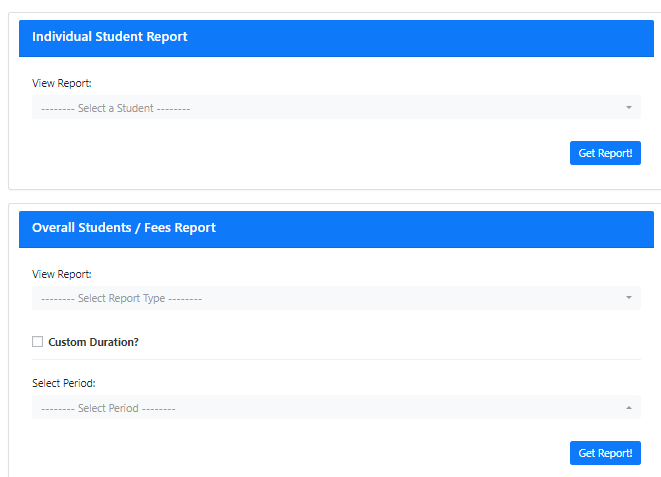 In advanced version, you can also view overall students or fees report for a custom duration or period ( today, yesterday, last week, last month, last year etc. ). 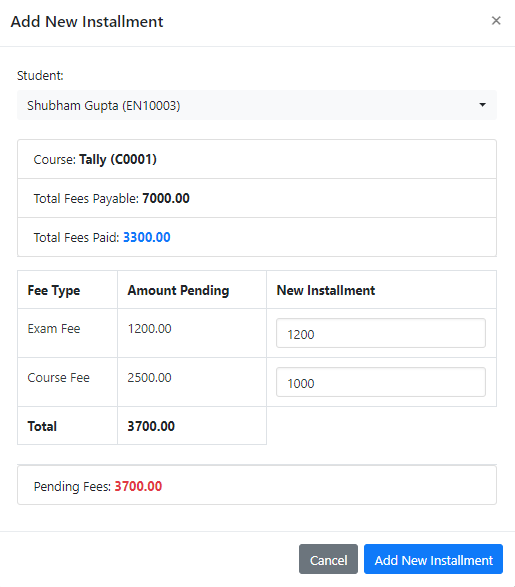 In advanced version, students can pay their fees on the basis of fee type or all at once by selecting “Pay Total Pending Fee”. 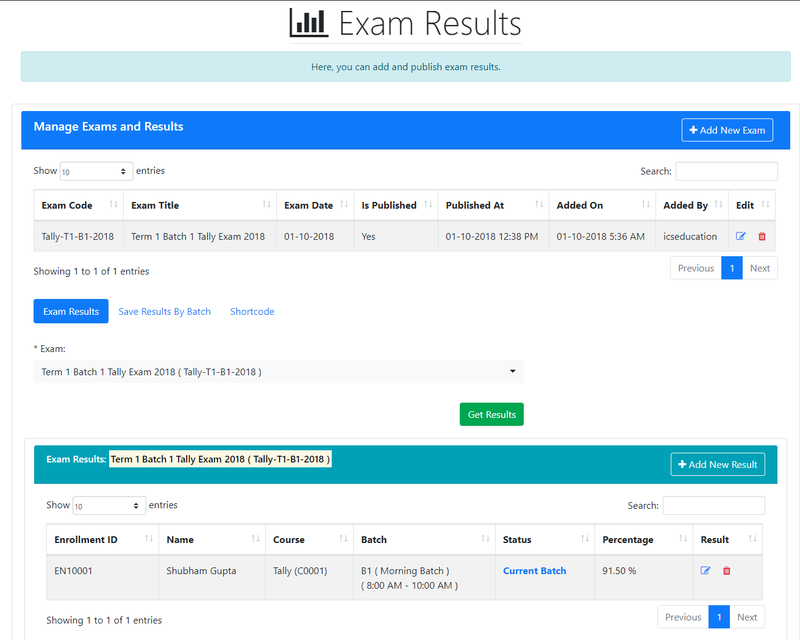 Advanced version also supports exams and results management. 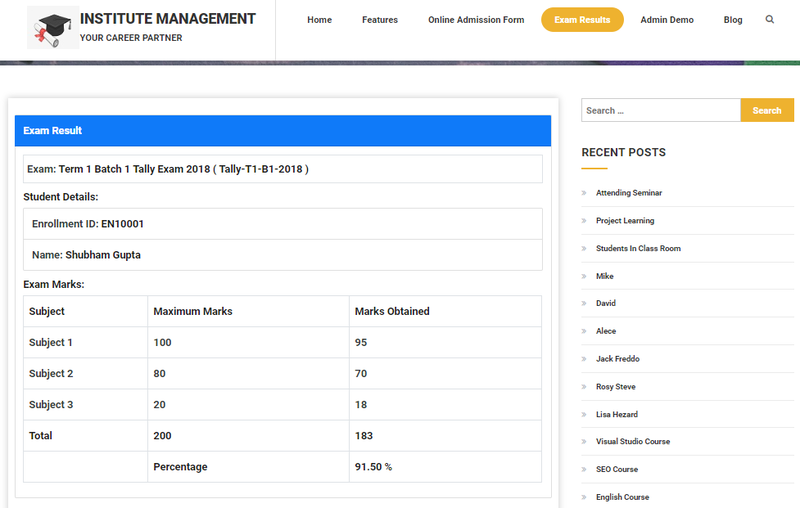 Administrators with appropriate permissions can add a new exam having any number of subjects with maximum marks respectively. Also, administrator can add student results which include marks obtained in each subject. 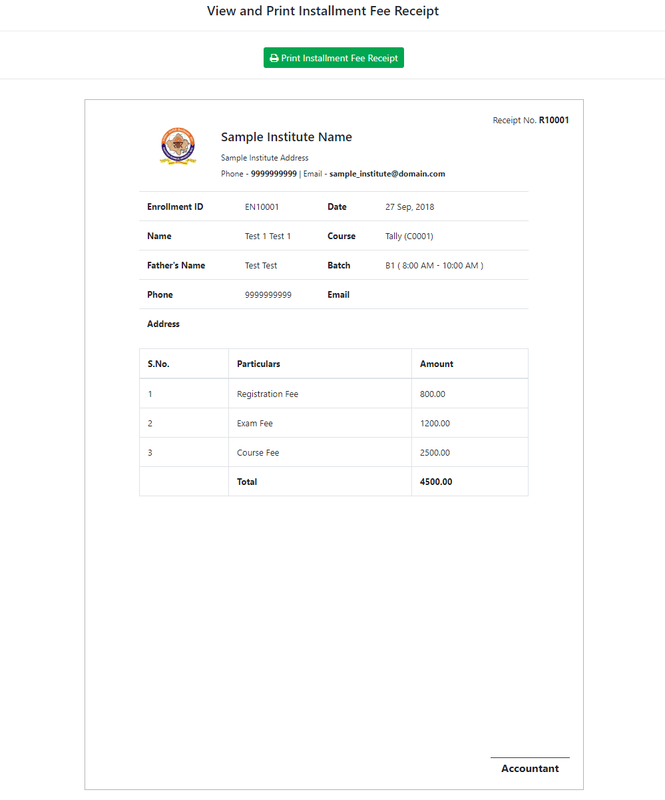 And, using short-code [institute_exam_result], result form can be display on a page or post. From there, student can select an exam and provide enrollment ID to view the result. In the exam results section, you can add a new exam or results of an existing exam. 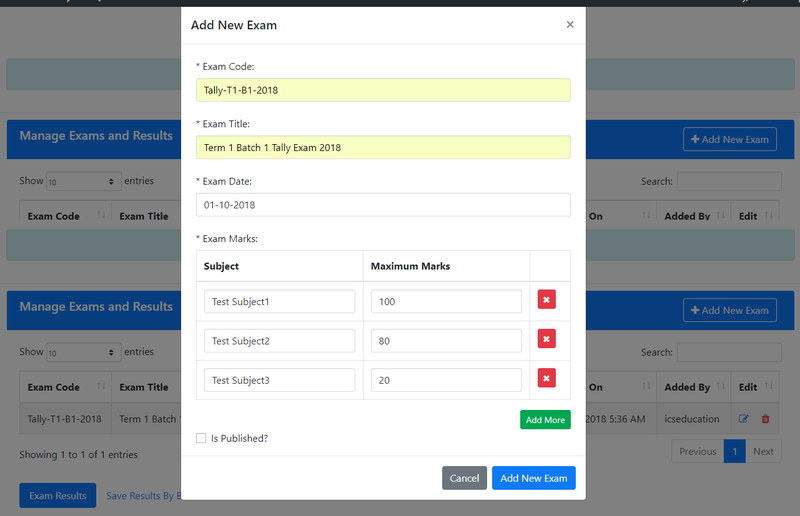 When adding a new exam, you can provide a unique “Exam Code”, exam title, date and maximum marks for each subject. When adding an exam result, you can select a student and provide marks obtained in each subject of the exam. In your website front-end, you can select an exam and provide an enrollment ID to get the result. 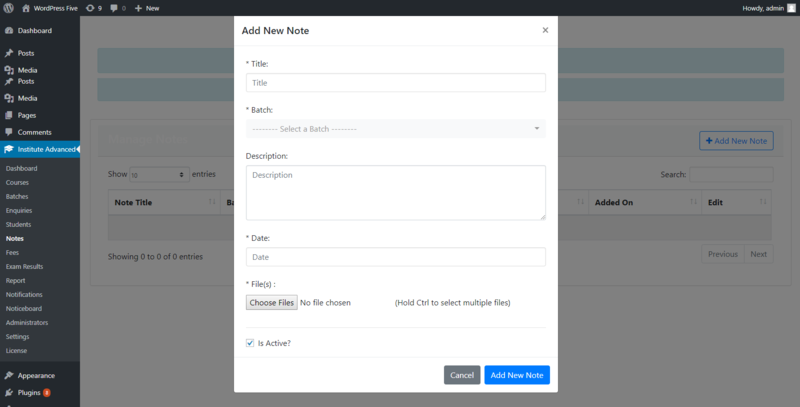 In advanced version, you can add a new note, its title, notes according to batches, date and also uploads files in different formats.